Napco Modern Plastic Products Company - Technical Division launches a new user-friendly website focusing on customer needs and requirements. In-depth information about flexible packaging helps visitors search for desired products according to preferred criteria and specifications. Interested prospects can engage in online live chat, and contact product experts to gather more product-based information. In addition, customers can request for quotations (RFQs) and submit inquiries, as well as download necessary brochures and Napco Modern Plastic Products Company - Technical Division’s corporate fact sheet. Moreover, visitors can remain in-tune with company events, news, and developments, in the ‘News’ section, as well as develop business relationships in the ‘Join Our Team’ and ‘Become a Supplier’ sections. 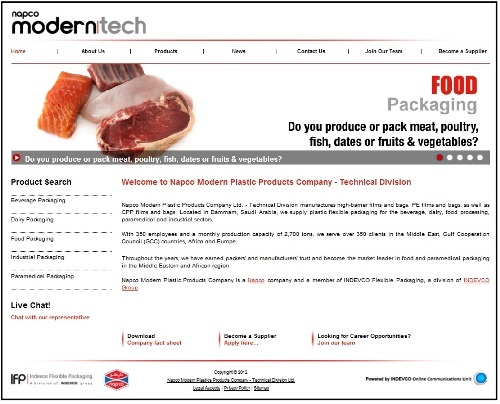 The website provides information about Napco Modern Plastic Products Company - Technical Division, its vision and mission, quality policies, and global export operations.